Voluspa means "bringer of wisdom" or "goddess of wisdom" in tales of ancient Scandinavian lore. 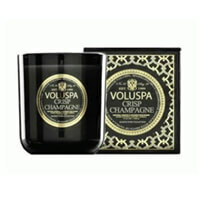 Voluspa candles have lavish fragrances, rich, unique and sultry, even when mocking the most simple scents. Voluspa's wax formula is inspired by traditional candle-making formulas handed down from the classic European candle makers. Voluspa's wax has a buttery texture and soft density which lends ideally to heavy fragrance concentration. 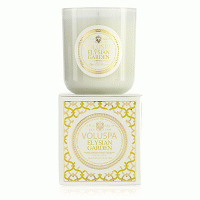 Voluspa candles are considered one of the finest burning candles in the industry because of their creative, fabulous fragrances and fresh, innovative design. 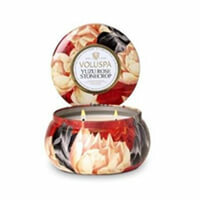 Using a food grade paraffin wax base, Voluspa candles burn for an unprecedented 85 hours. 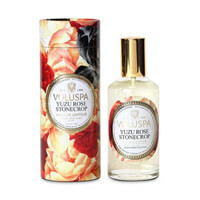 Voluspa calls on years of expertise in the fragrance components and essential oils to create unusual, creative scents. 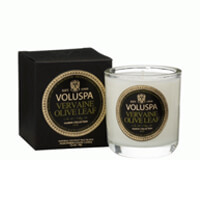 Considered one the premier boxed candle lines available today, Voluspa places intense consideration on all aspects of packaging their candles and Parfums. This is a passion for Voluspa. Voluspa means bringer of wisdom or goddess of wisdom in tales of ancient Scandinavian lore. this may explain why Voluspa is in all the finest stores and periodicals throughout Scandanavia. 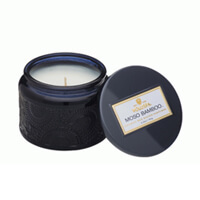 to produce the finest burning candle and most innovative fragrance concepts in the industry, using creative complex scents blended with fresh unique design. 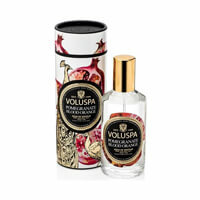 Voluspa is sold in boutiques nationwide ranging from home decorative stores, to spas and bath and body retailers. Celebrity devotees include Steven Spielberg, Halle Berry, Catherine Zeta-Jones, Eva Mendez, and Melanie Griffith.